The story centers around Gloria Davis (Lorraine De Selle), an NYU doctoral student working on her thesis “The Myth of Cannibal”. She contends that the “evil white man” concocted the cannibal legend to warrant the destruction of these South American tribes in the name of greed. So she and two of her friend heading off for the Amazon to do a little first-hand researcher. Unfortunately for our heroes (well they are not really the heroes, I truly believe the cannibals are the heroes of this film), they meet up with Mike (John Morghen), a sadistic coke-addict, and the fun begins. It is Mike’s sadistic behavior that forces this normally friendly grubworm eating natives to revert back to their primitive cannibalistic ways. It is like that old say “once a cannibal ….always a cannibal”. There are dismemberments (if you get my drift…ooch), new and unique body piercing, and the villains in the end instead of “getting their just desserts”, become just dessert. A group of young people travels to the Amazonian jungle to prove that cannibalism does not really exist, but will quickly meet primitives that will prove them wrong. In the pure style of Italian Cannibal movies such as Cannibal Holocaust or Last Cannibal World, Cannibal Feroxis ultra-gore, very sexual and features white stupid and shameless people lost in the jungle. 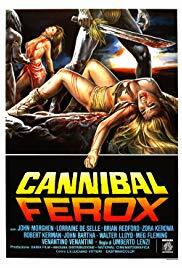 In comparison with its fellow Cannibal Holocaust, I actually found the story in Cannibal Ferox to be more interesting, and one could almost speak of an “intrigue”. Aside from that, the two movies are actually very similar. You’ll find in Cannibal Ferox your lot of totally unnecessary animal-killings. The gore scenes are pretty scarce but quite intense and well-realized. 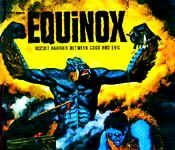 I am really found of these old special-effects and the bright red blood typical of old-Italian horror makes things really realistic! The movie tries to include some kind of morale by featuring an interesting discussion around cannibalism and how it may just be a civilized invention to describe primitives. I found it an interesting attempt to give credibility to the genre, but one that really contrasts with all the clichés presented in rest of the film. Cannibal Ferox is one of the great cannibal movie and a must-seen for those who enjoy the genre. A little better than the famous Cannibal Holocaust in my opinion.